To read previous changelogs, please visit this link. You must give appropriate credit, provide a link to this texture if it is being used in any situation. You must not make any changes to the pack and release publicly. You may make alterations for yourself only. Awesome for building, impossible to confuse the textures. Cobblestone could be a little better, but overall it's an awesome pack. Do you think cobble stone looked better if it looked a bit like the brick? I do agree, the cobblestone looks rather ugly. Updated to V2.1 and now I like the look of Cobblestone and the picture is updated aswell. Updated to V3. Read the change log for the changes and check out the bottem of the post. Updated again because i needed to make more changes, New download link above and read the change log. I'm not really one for these simple texture packs, but I must admit there is something that I like about this one and I can't quite put my finger on any one specific texture or item that does it, but if I were only able to use 16x then I'd likely to pick this one. I really dislike the texture pack that comes with the game, this one would make a good replacement to me. Are you planning on doing tolls and stuff? Yes i am, They might come out tomorrow. Just a heads up, there is already a pack going by a similar name. Yeah mate im sorry about that, i didnt know there was one already. 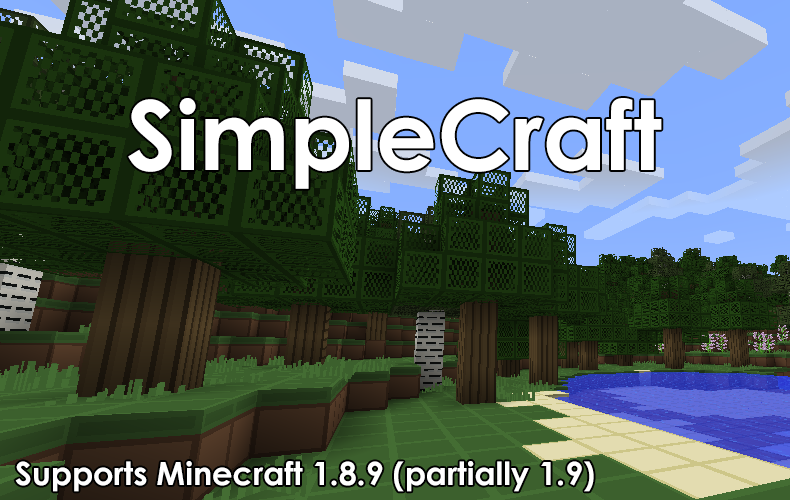 But mine is SimpleCraft not SimpleKraft so that won't be any trouble will it? Please read the change log for the changes. Major change was the crafting menus and new simple tools and items. would this help the game lag less? like i could turn draw distance up? cus i know if u have an HD texture pack it lags, so would this work in reverse? You sir, are a dumbass. RandomMac5, you are now a famous sir, MAN! I still remember the old one you gave me. NOW PEOPLE ON YOUTUBE ARE USING IT! I dunno, i havent talked to you or neoneo1212 in a while! Hug the creepers, don't be scared!